Join the discussion on our forums! Come discuss Primal Fusion over in our dedicated Primal Fusion discussion topic. Give a minion +1/+1 for each of your Totems. Golce and Dabbana have a new line of Earth Totems available at vendors everywhere this holiday season. Could this be a better replacement for Rockbiter Weapon than Lightning Bolt? This allows for similar burst with Al'Akir the Windlord and favorable trades in the early game without overload. Sleeper card of the expansion for totem based shamans. 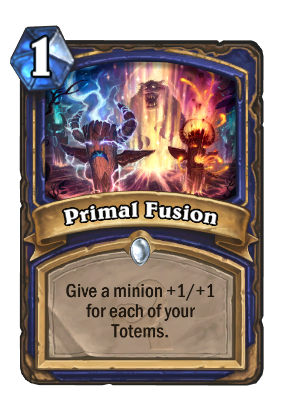 At first glance, you think 1 mana 1/1 if you've got a totem, which seems meh. But think about how many times you've coined out Totem Golem in round one and are left with one mana floating next round. Well if you've got Primal Fusion you turn him into a formidable 4/5 in round two. It's a great top deck later in the game when you should have three to four totems out. Put it on Mana Tide Totem with three totems and he turns into a 3/6. At first I was contemplated wether this card was gonna be usefull in my totem-shaman deck, but after trying it worked really well. Cast is on Thunder Bluff Valiant to protect him. With like 4 totems on board and this card on Al'Akir the Windlord.....or imagine 2 of these on Al'Akir the Windlord with some totem on board at turn 10. Can one of these minions be one of the totems themselves? This is the worst card shamans got this expansion. Just think about it for a while. Dear hater, there are totem decks, just as 2/2 for 1 it would be op, and 2 totems you can get outside of a totem deck pretty easily. In a totem deck you can get this to 4/4 or 5/5 for 1, that is in no way bad, try being creative please and save your comments for cards you comprehend. I don't think he meant that the card was bad dude. he's pretty much saying that all the cards shaman got this expansion are pretty god tier and this is at the bottom of the pretty good batch of cards. Not hating on it at all. He meant worst as in this is about a C+ card and all the other Shaman OG cards are A or better. This was needed though as Shaman were the worst class for a reason. It needed better cards. I think this card is awesome, because the mere existence of cards like that in the game, automatically gives your totens a psychological taunt. This is really the only card Shaman got this expansion that isn't amazing, meaning Shaman is getting a well deserved buff for this expansion. This card seems just... Okay.